Note: This vacuum is currently unavailable on Amazon and elsewhere and we recommend you take a look at a suitable replacement, for example the Hoover Linx Cordless Stick Vacuum. The Hoover Flair Bagless Upright Stick Vacuum is the lightweight vacuum cleaner that you can depend on. Living up to all of the qualities and expectations you’ve come to depend on from Hoover, the Flair Stick vacuum works amazingly on all of your bare floors and light carpeting, plus a whole lot more! Here we will review this cleaner and tell you why we think that it is one of the very best stick vacs on the market. We are certain that you will agree, as this is a top-seller on Amazon with tons of positive reviews. Hoover Flair Bagless Upright Stick Vacuum, top-rated vacuum with a lightweight design and powerful suction feature. When you want a quick way to clean the floors in your home, the Hoover Flair gets the job done in a hurry. Whether you need to pick up small messes or want to clean the entire floor, the Hoover Flair helps you effortlessly and efficiently get the job done. Lightweight and compact, the Hoover Flair stick vacuum cleaner is suited to clean bare floors as well as lightweight carpets. It weighs just 10 pounds, is less than four foot tall and has numerous features that you can appreciate. Do not allow the small size of this vacuum cleaner to fool you, because it is small only in size and not in power. The vacuum cleaner features a powerful 6-amp motor that will get the job done just as you need it to. With a 20-foot cord, there is less stopping and starting and more of getting the job done. And, an EZ empty dirt cup also makes this vacuum one that can be appreciated. The multi-stage filtration system makes it easy to empty with a push of the button. Since there are no bags to change or replace you will save yourself a lot of time and effort. And, without the bags you will find cleaning the floors a much more pleasurable experience that is a whole lot less dirty. Take a look at some of the other awesome features found on the Hoover Flair and you will easily understand why this cleaner is such a popular choice for those looking for a stick vacuum that has more. 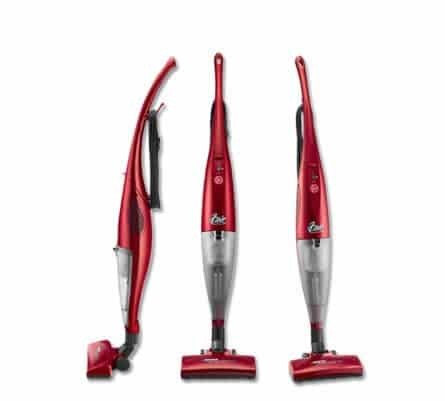 The Hoover Flair stick vacuum is certainly a cleaner that will get the job done and meet all of your needs. It does this with a quality machine at an affordable price. You should consider this top-rated cleaner when you are in the market for a stick vacuum cleaner. It will live up to all of your expectations and more.